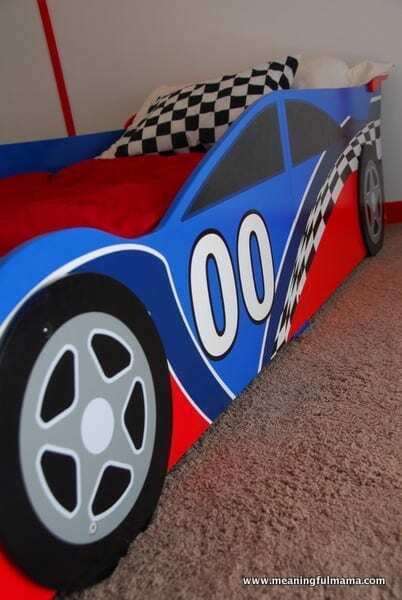 We purchased the Kid Craft race car bed. It was great because it fit our crib mattress, so we didn’t have to buy a whole new mattress. This was really Corban’s only Christmas present. 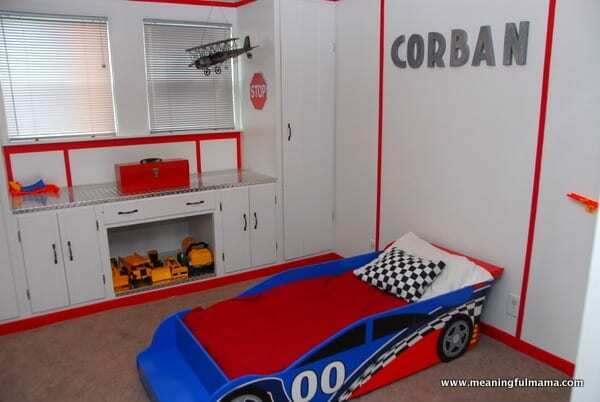 We were those parents who stayed up late the night before assembling the bed. He woke up to find it in the middle of the living room and was delighted. He loves it. Whenever he shows someone his new room, he opens the door and crawls right up into the bed. 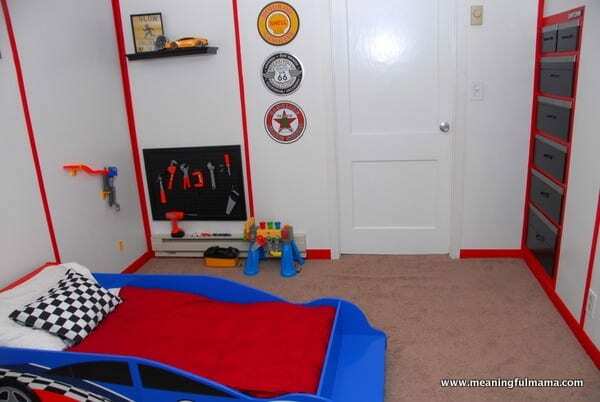 The transition to a big boy bed was really easy for him. I don’t know if it is because of the new bed, but we put him in at 2 years 1 month, and we haven’t had a problem. He is starting to test the waters a little now, but overall it has been great. I sewed the small race car pillow. 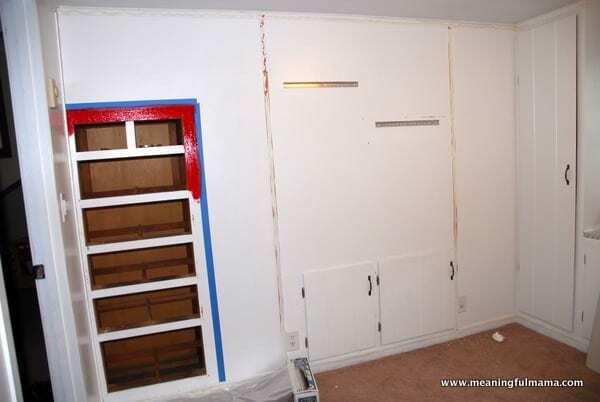 The hardest part of the makeover was the red trim. My husband did all the painting. His uncle owns a painting company, and painting was one of my husband’s first jobs, so he has some experience and did a marvelous job. It was just time consuming. Our house used to be a cabin, and we did a lot of work after we purchased it. When we bought it, this room was wood paneled. 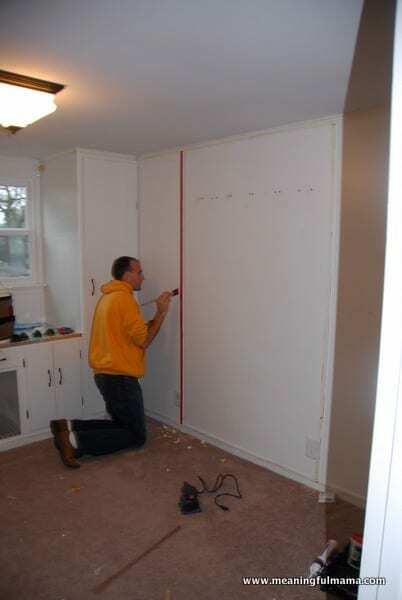 The red vertical stripes were covered with ribbon when it was our nursery for the kids. We had to remove the ribbon, scrape off the fabric glue we had used, sand it down and re-paint. It took both our efforts to make it all happen. We kept this plane from his airplane nursery room. I absolutely love it, and I couldn’t bare to part with it. We called a company that sells diamond plating, and they were able to custom cut it for our built in area. 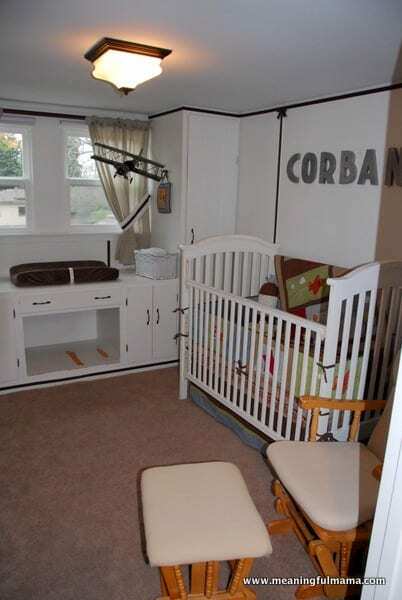 This area used to be the changing table for all my kids. 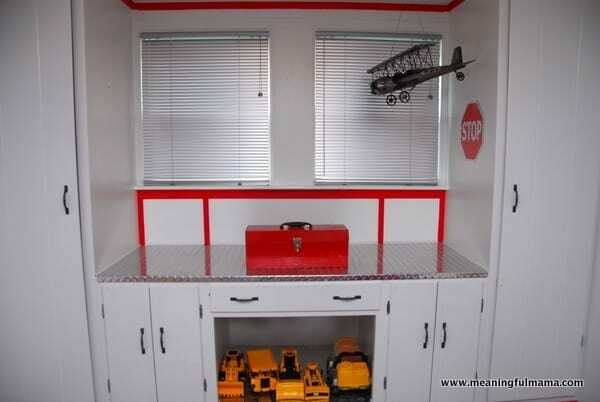 We have a great storable place for all of his construction trucked he had received for his birthday. The windows are metal blinds. 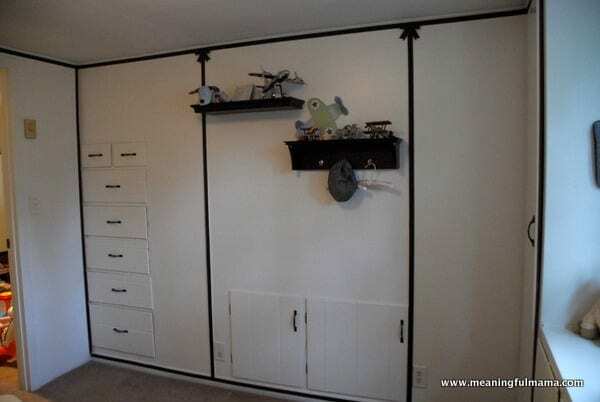 We wanted it to look like roll down metal doors. I have a tin stop sign on one side and want to find another for the opposite side. I love the character of this house with all the fun built in elements. We have never needed a dresser or changing table. 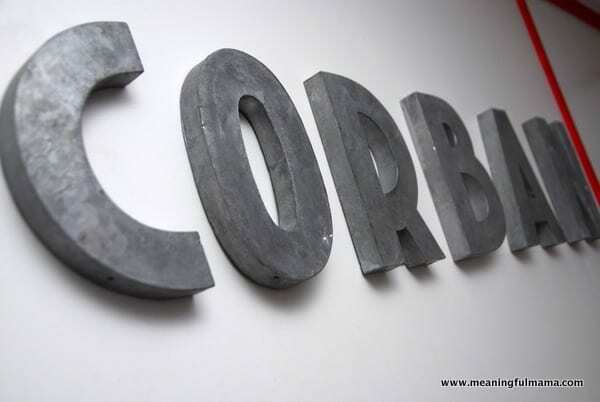 I love his metal letters. We received these at baby showers. They were from Anthropology a few years ago now. I fell in love with them, but they were expensive. Therefore, when people asked what I wanted, I told them the letters. A bunch of people contributed to buying a letter each. I’m thinking these are something he could have and enjoy his whole life. 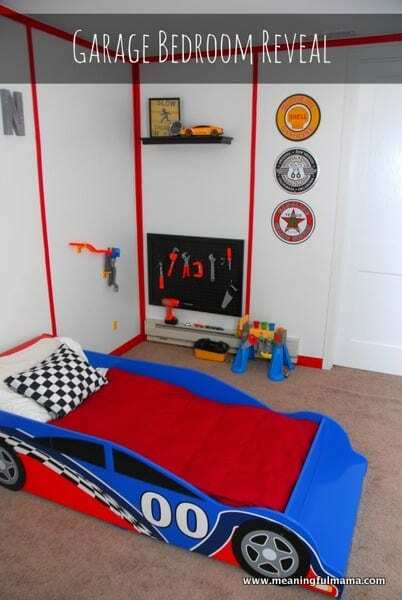 I think they are cool for a nursery, toddler room, teenager or even in his garage as an adult. 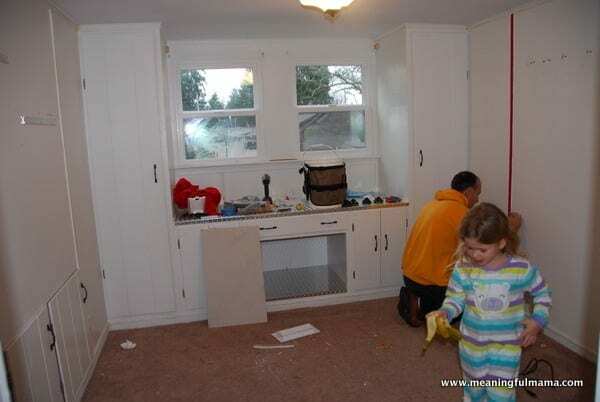 We decided to paint around the built in drawers to make it look like a Craftsman tool box. 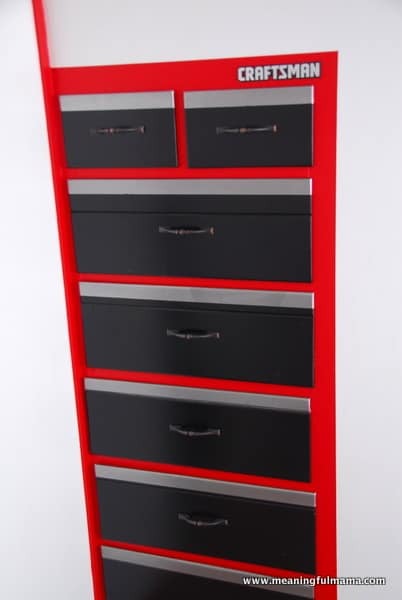 I could completely see this kind of makeover for any upright dresser too. We ordered the label online. 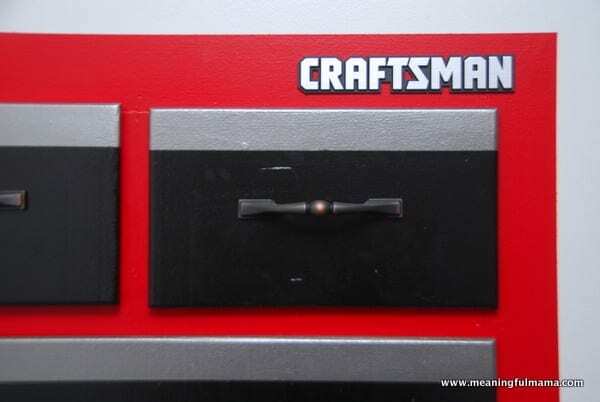 It’s an actual replacement label for the Craftsman toolbox, and I absolutely love how this idea turned out. We bought him the piggy bank from Pottery Barn Kids. I had been holding onto a $50 gift card for Pottery Barn Kids for quite some time, and I finally found my purchase. It has his name on it. The art is a really fun but easy thing to do. I purchased some black frames at Target. Then I just traced around the street sign images placed on an angle. 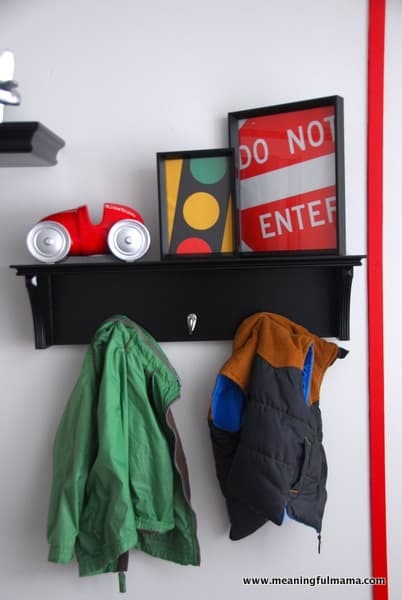 I cut those out, put them in the frames and there you have a simple, inexpensive DIY piece of art for a garage or car room. 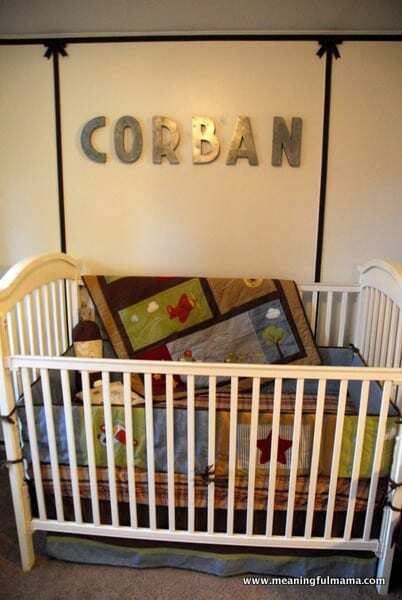 My husband made this tool storage rack for Corban. The tools were a gift he had received from my mom for Christmas. We have just had them in a toy box. Now they are on display. We had two old Ikea frames. My husband cut some pegboard we had on hand to the size of the inside of the frames. He spray painted it black. Then, he just screwed the two frames together to sandwich the pegboard. 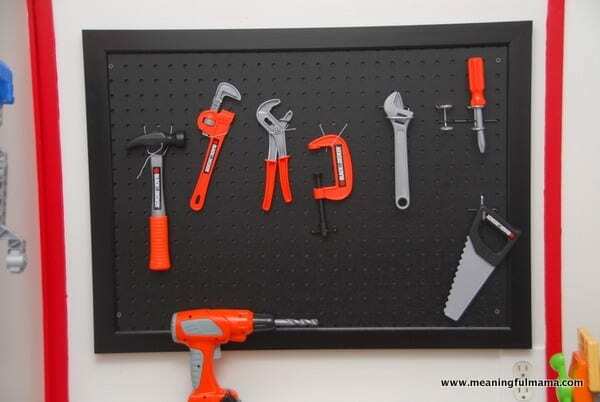 We put both actual peg board tool hanging elements we had on hand as well as some stretchy string we also had so that he has a great way to hang his tools. 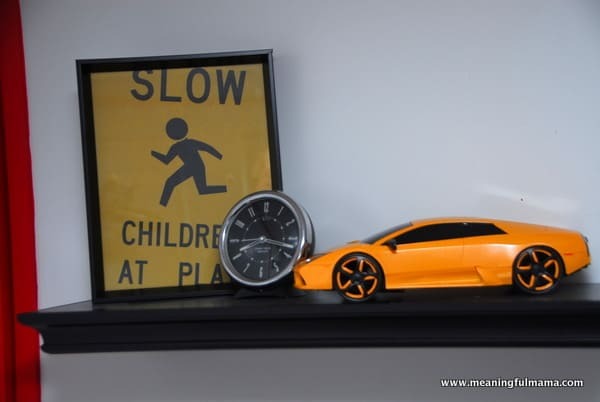 I bought Corban his first remote control car to store on his shelf and add a decorative element. 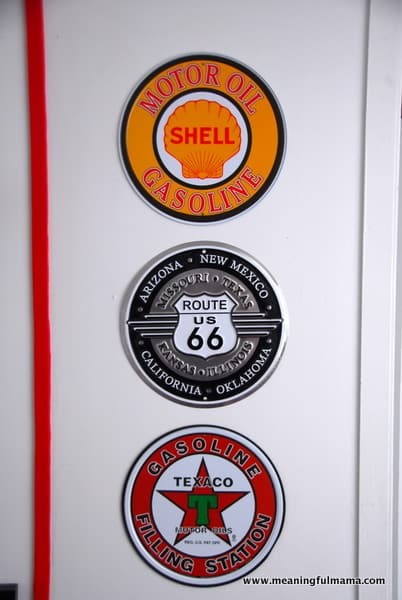 I purchased a few tin signs to hang on the wall. 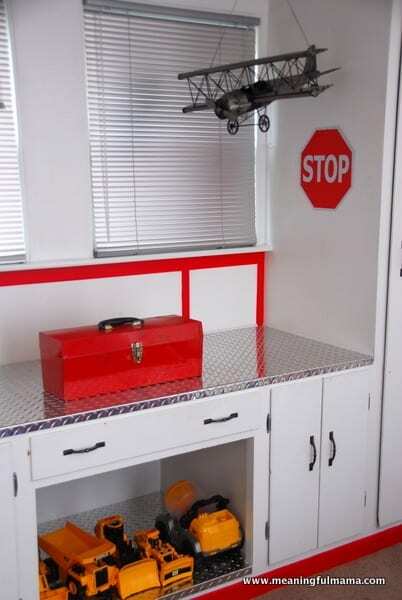 Here is our Craftsman toolbox dresser. Previous Post: « Summer Activities List for Seattle – 75 Ideas!!! 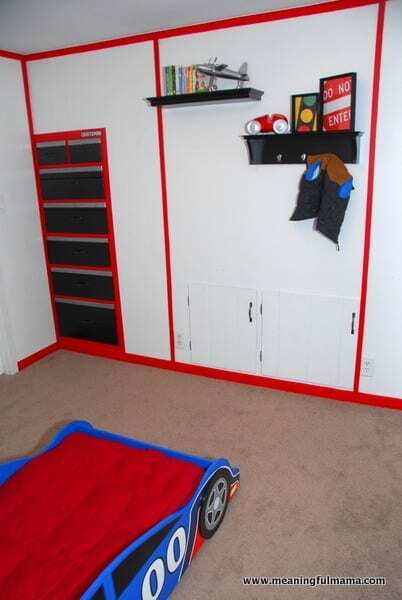 Miles is literally pointing at the car, saying car and amazed at this room as I scroll through the pictures. That’s so cute. You’re in trouble now! Turned out cute! We just switched our little guy into a car bed too; he is growing too fast!